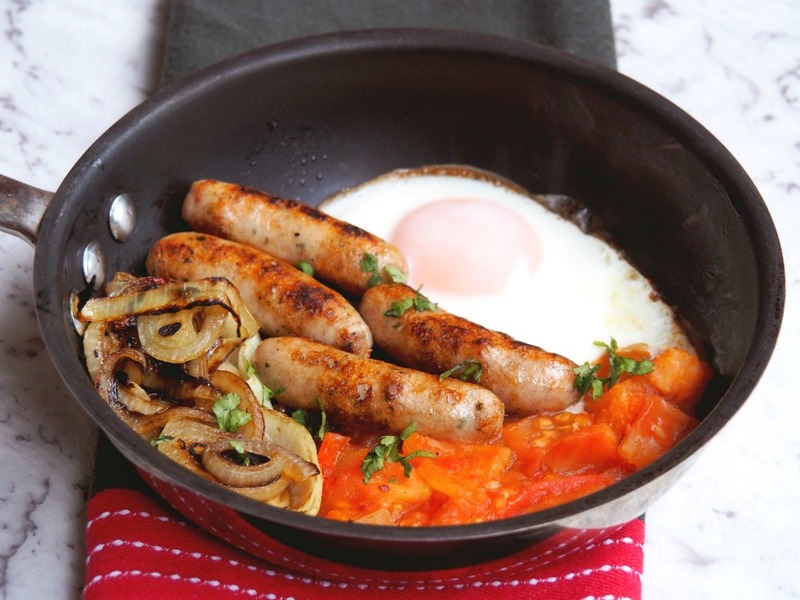 You can enjoy sausages with the lot in this one pan wonder! 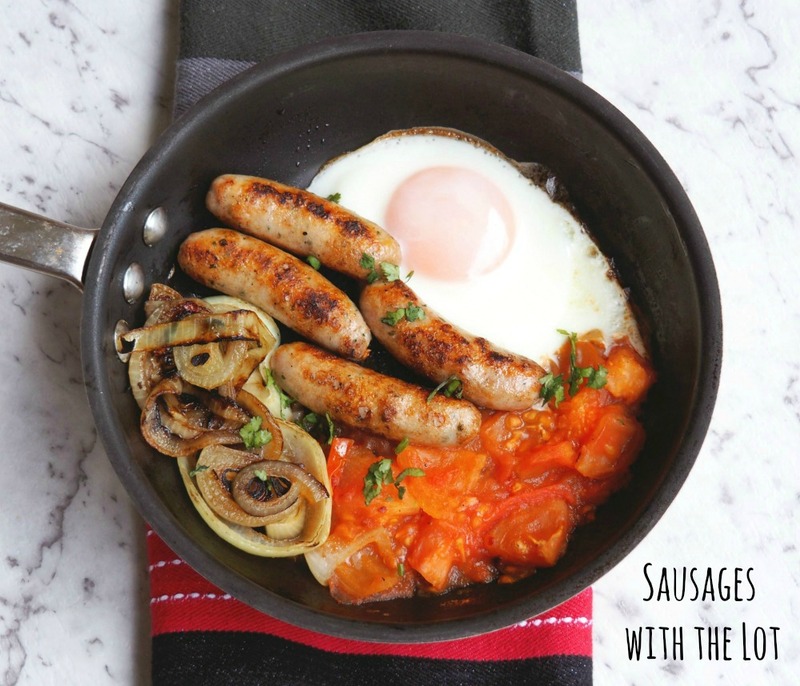 It’s perfect for breakfast, lunch or brinner! You know that saying “you can take the girl out of England but you can’t take England out of the girl”? Well, I think that is totally true for me, especially when it comes to English breakfasts. 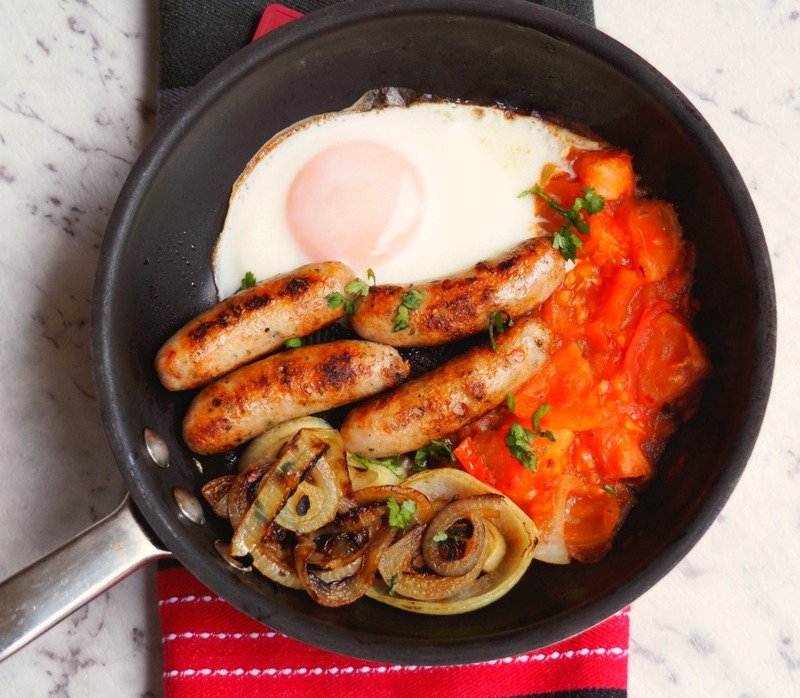 Even though I’m a bona fide Australian (complete with a blue passport,) and even if it’s hot enough to fry an egg on a car bonnet outside, I still love a cooked breakfast. More to the point, I love all the ingredients so much so that I could eat them for breakfast, lunch or brinner! Of course, cooked breakfasts are not really healthy per se, although I like to think this version is the exception. You don’t need to use a lot of oil, there’s fresh veggies and I like to use 98% fat free chipolatas, not because they’re low in fat but because they’re big in taste. These quantities will easily feed four but if I’m home alone, I quarter the ingredients and make this one-pan wonder for one. It’s fresh, filling and thanks to the herbs and the chilli, it’s popping with flavour, although I do sometimes add a sneaky spoonful of Shirl’s Eggplant Chutney on the side. I just can’t resist it! Do you like your breakfasts hot or cold? Are you a fan of brinner too? Cook chipolatas in heated oiled medium frying pan until cooked through then remove from pan and set aside. Cook onion in the same heated pan until it softens. Add tomatoes and chilli flakes and cook, stirring occasionally for about 10 minutes or until the tomato softens. Season to taste. Meanwhile, preheat the grill. Return sausages to pan. Carefully crack eggs into pan and cook under the grill for about 5 minutes or until the eggs are just set. Note: If your frying pan doesn’t have a heatproof handle, just wrap the handle in several layers of foil to protect it during grilling.